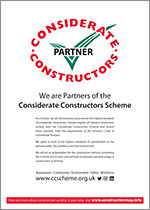 These posters can be displayed on any site registered with the Scheme by a Partner and are also available in 5 year, 10 year and 15 year versions for those who have achieved longevity as a Scheme Partner. These measure 1.80m x 1.20m and are available from the administration office at a cost of £32.50 (+ VAT) per flag. When used, these should be maintained in a good condition. Sheet of stickers (57x50mm), 20 per sheet, available for £7.21 (+ VAT) each. A 2000mm x 800mm pop-up to help advertise your affiliation. The easy-to-install, personalised pop-ups are designed to promote your Partnership at any event you may be running or attending. The pop-up banner is available from the Scheme for £175 (+ VAT) each.